In a separate suit filed on November 4, 1996 in New York State Supreme Court, the Population Council and Advances in Health Technology charged Pike with fraud.185 The lawsuit alleged that Pike had not properly accounted for the money that was invested in his entities and had ciphoned [sic] off money into some dubious off-shore entities.186 While the Population Council and Advances in Health Technology did not seek to rescind the sublicenses Pike had issued to Danco Laboratories and other companies to manufacture and distribute the drug, they did seek to wrest control of the company from him by having his interest in the entities transferred to a court-appointed receiver.187 The Population Council strongly believed that Pike’s past legal troubles and his efforts to conceal them disqualified him from serving as a fiduciary and the lead business entrepreneur in the RU-486 enterprise – a politically sensitive and controversial venture that needed a person of irrefutable integrity at its helm. 178 See Editorial, The Troubles of RU-486, N.Y. Times, Nov. 8, 1996, at A32. 179 See Tamar Lewin, Abortion Pill’s Legal Woe May Be Nearing an End, N.Y. Times, Jan. 25, 1997, at A7. 180 See Gina Kolata, Business Dispute May Delay Introduction of Abortion Pill, N.Y. Times, Nov. 1, 1996, at A20. The Cayman Islands entities were not required to disclose the names of officers and partners. See id. 184 See Sharon Bernstein, Persistence Brought Abortion Pill to U.S.: Two Feminist Activists Culled Nonprofit Organizations and Dedicated Individuals To Do The Work That No Pharmaceutical Company Was Willing to Tackle, L.A Times, Nov. 5, 2000, at A1. 187 See Caryle Murphy & Kathleen Day, Abortion Pill’s U.S. Debut Snagged by Business Dispute: Sponsor Seeks to Oust Associate For Not Disclosing Disbarment, Wash. Post., Jan. 12, 1997, at A1. 188 See Tamar Lewin, Legal Bout Over Abortion Pill Ends: Group Will Apply For FDA Approval, L.A. Daily News, Feb. 13, 1997, at N19. The Population Council had previously intended to distribute RU-486 through Advances for Health Technology, which was subsumed into the new company. See FDC Reports, Mifepristone (RU-486) Distribution Given to a New Company Headed by Former Generic Exec Van Hulst, The Pink Sheet, Feb. 17, 1997. 189 American Political Network, Spotlight Story, Story RU-486: Suit Settled; Sales May Begin in ’97, 7 Abortion Rep. No. 137, Feb. 13, 1997, available in WL APN-AB File. The lawsuit contended that Mr. Pike had misrepresented himself to the Giant Group. According to the lawsuit, Mr. Pike is a disbarred lawyer who was convicted of forgery in May in North Carolina and is on probation after receiving a two-year suspended prison sentence. Mr. Christensen’s public relations firm provided copies of Mr. Pike’s affidavit before the North Carolina State Bar, which took away his license to practice law in 1993, and legal documents describing his suspended sentence for forgery. This is weak confirmation. However, the disbarment action is available, July 9, 1993, and it includes an affidavit signed by Joseph Daniel Pike, acknowledging the actions that led to his disbarment. Margaret Catley-Carlson, the president of the Population Council, said her group told Mr. Pike in late July to divest, after learning that he had been disbarred for forgery in a 1985 North Carolina real estate deal and had been given a suspended two-year sentence. Ms. Catley-Carlson said she had long known Mr. Pike as a backer of products shunned by pharmaceutical companies, like the Copper-T intrauterine device. So the alleged fraud was over thirty years ago as this is written. A decade later, he was given a suspended sentence, which is likely an indication that the offense was not major, but it would still be, likely, a felony, and would surely lead to disbarment for a lawyer. He did not serve time in prison. In the RU-486 affair, while he was accused of fraud there, it appears that it was all settled, there were no criminal charges. The North Carolina J. Daniel Pike was obviously a businessman dealing with major funding. That could be significant. He signed the articles of association of IHHI, (see pdf page 6). The signature is close enough to that of the North Carolina J. Daniel Pike that I conclude this is the same person. On the face, JPIH Holdings was formed to be Joseph Pike IH Holdings. JPIH Holdings LLC (Florida) has Pike as manager and registered agent, with a Florida address. JPIH Holdings likely represents his personal investment. It is a Delaware corporation, formed 5/24/2013. From the date, Pike was an early investor in Industrial Heat. And this is meaningless. Pike’s history could be of concern to someone placing great reliance on him, and the RU-486 affair was largely about his being heavily trusted but not having disclosed his (then recent) past. As an investor, that would not be relevant. Author Abd ulRahman LomaxPosted on May 8, 2017 May 8, 2017 Categories lenr-forum, Scientific Method7 Comments on Loopy devices? When I can’t make up new words any more, shovel dirt in my face. This one is easy, though, a rather obvious back-formation. The occasion is the reaction on LENR Forum to new filings related to the Motions in Limine. For those who need a program, these are motions seeking to exclude evidence as improper,perhaps likely to emotionally (and irrelevantly or deceptively) bias a jury, or as spoliated, i.e., damaged through deliberate action or carelessness when care was due. Yeah, I agree that JMP/Rossi are for most purposes (although not technically) one and the same. What is interesting to me is sig mentioned a lease agreement, and that he had seen it. That is new information, at least to me. And how did he gain access to it? Inquiring minds want to know, and all that. IHFB is more or less unique on Planet Rossi in that he does acknowledge the “customer fraud.” In a new document that IHFB has not seen yet, evidence is emphasized that countersinks the screws. (None of it is particularly new, we just see a little more of the JM/JMC/JMP negotiation) that makes the “Johnson Matthey” fraud totally clear, and Rossi’s later claims about it as probable perjury. IH does not here assert all the evidence that has been shown. For example, Bass saying to Rossi that he’s not clear how to answer questions about Johnson Matthey. Where did he get the idea that Johnson Matthey was involved? He clearly has the idea that the Doral operation is a Johnson Matthey operation. This is usual absurdity that have been heard many times. AC current have no defined polarity ( is in AC !) so if you reverse a clamp the instrument will detect a 180 phase shift of the current but the power calculation will remain the same ! All your formulas are wrong. I used to know an old doctor, now dead, who actually met and treated Papp for [redacted]. He said Papp was a flaming nut case (not his words– he said [redacted]). Note: I have redacted the medical information. (Not entirely, a doctor who treats someone and calls him a “flaming nut case,” would probably be violating HIPPA and CMIA, and repeating this could still be a violation.) I’m not a California resident, but just to make the point. CMIA prohibits any person from releasing private medical information, not only the providers listed. There are sources warning the media, for example, about publishing such information without permission. I’m reminded of the physician who accessed the medical information, particularly death certificate information, for Atkins, the cardiologist who developed the Atkins Diet, and then released it for political purposes (and it was misleading). Zeus46 went on to quote many relevant regulations and issues. Without doing extensive legal research myself, it looks like, on the face, the regulations set up sanctions for physicians, in particular, but also some other individuals or entities, for disclosing information similar to what maryyugo has posted. It is possible that the original disclosure by Papp’s doctor was not a violation of regulations at the time, but this does not excuse maryyugo from the present violation. It is obvious to me that Zeus46 knows the real-life identity of maryyugo, it is not difficult to find, since he outed himself years ago, but continued using the “anonymous” identity. The real person, I’d give it more than 99% probability, is a physician licensed in California. It appears that “Mary” is so eager to present classic debunkery, and so eager to prove it with “evidence,” that he completely ignores legal risk from his profession. Zeus46 did not actually reveal that maryyugo is a physician, so he did not violate LENR Forum rules against outing or doxxing. I’m surprised you can put your clothes on by yourself in the morning. You can, can’t you? PS: dead people can’t sue for damages nor can anyone on the behalf. Not to mention that I am not releasing any of Papp’s sordid records because I never saw any. I am not even reporting facts about Papp! I am simply reporting an anecdote about what someone told me. Hear say. Also you seem to have lost track and wandered into the wrong thread. Anyway sue me. Give it a try. I am terrified. FWIW, Abd’s comment on this related not to anyone suing you (ridiculous) but to professional disciplinary action for which no doubt the rules are different. However, I have no idea what is your profession, nor any of the details here, so what he suggested remains for me highly speculative. I would assume that Zeus46 knows Mary Yugo’s identity. It is trivial to find. I have confirmed the identity and “Mary” has revealed, at various times, personal history that matches that of the identified person. One will see people, in various fora, calling Mary by the real name. Mary denies it, but the real person could trivially torpedo this, if different. I was concerned that the comment here might not be from Mary, but could be a troll. This has definitely happened in the past. So I checked. The information I have as admin here is consistent with the known identification; more than that I will not say. Absent necessity, I will respect user rights. Mary Yugo is a licensed physician living in California. He has a history of debunking (and has done real investigation, qualifying him as a skeptic in some cases). However, he is also highly opinionated and knee-jerk contemptuous of others who might be pointing something out that he does not understand, and this sequence shows it. The risk is low, but Mary has not understood the risk. I do not know how CMIA is enforced, there might be no precedent, but the situation Mary describes is of a physician treating Papp revealing what would now be illegal to reveal (I don’t know about then). According to Mary, that physician is deceased, but CMIA also prohibits any person from revealing such information. And any person may file a report. If there are no provable actual damages, the potential fine is limited to $2500. Mary claims it’s “hearsay.” Yes, it is. Hearsay about medical information, and it is contrary to CMIA regulations to repeat that. Theoretically, to anyone. So far, the walls don’t have ears, and in a case like this, my guess is that the courts would rule that CMIA does not trump ordinary freedom of private speech. But this was not private speech. It was also unnecessary and irrelevant in context. Mary is a gossip. There are resemblances, to be sure, between Papp and Rossi. And as to what is involved here, an alleged physician’s diagnosis, that merely demonstrates what was already known: Papp was not necessarily, himself, a reliable witness, and from the submarine incident, may have been capable of staging an elaborate fraud. The diagnosis, however, does not show that the Papp engines did not work, and from what I’ve seen, there is sufficient evidence that they did, in fact, work, to keep this affair in the realm of mystery. Mallove wrote an extensive article on this, and I consider some of his expressed opinions there unfortunate and not yet supported by reliable evidence, but … there are some things that we may never know. Or maybe the “Papp effect” will be confirmed in some way. What I have seen in this line is quite unconvincing. We also know, then, that Rossi is an unreliable witness and is capable of arranging an elaborate fraud (the fake customer!). We know that Rossi was accused of various frauds in Italy; the ultimate disposition of all that remains a bit unclear to me. Rossi has claimed that all charges were dismissed and all fines refunded, but I have not seen that conclusion from any independent investigator. However, all that does not demonstrate that there is no Rossi Effect. Plaintiffs claim to have invented a technology called the “E-Cat” capable of violating the law of conservation of energy by producing far more energy than it consumes. First of all, the plaintiffs do not claim that the E-Cat is capable of “violating the law of conservation of energy,” and the concept of “consuming” energy is scientifically defective. What is referred to is input energy, and, yes, it is claimed that the E-Cat generates more heat than could be produced by input energy. However, this does not violate conservation of energy if there is a fuel. As a trivial example, it takes energy to detonate a stick of dynamite, but there is no violation of energy conservation just because the explosion releases far more heat than is generated by the blasting cap that triggers it. Energy “input” must include the potential energy of all system components. Rossi did not originally provide any theoretical basis for his claims, but he was generally working with LENR, so the general claim would be that there is a nuclear transformation releasing the energy. That introductory comment was just plain wrong, because Rossi doesn’t make that claim, and a working Rossi device would not violate conservation of energy. Conservation of energy is an aspect of the first law of thermodynamics, and the IH experts have pointed to violations, but that was in the testing, as to the behavior of steam, not about the claimed effect itself, which would presumably be nuclear in origin. Have the attorneys misunderstood? If possible, this should be corrected. LENR should not be on trial in Florida. My first answer is: Probably, what exactly do you need explained? That was, of course, a direct answer to Krivit’s actual question. The post is undated, but it’s the latest “Recent News Article” at this point. Krivit takes Fig. 1 from 1993Fleischmann-Pons-PLA-Simplicity and adds some lines to it to make the displayed figure. One can therefore pose the question: “How can it be that the temperature of the cell contents increases whereas the enthalpy input decreases with time. 9” Our answer to this dilemma naturally has been: “There is a source of enthalpy in the cells whose strength increases with time.” At a more quantitative level one sees that the magnitudes of these sources are such that explanations in terms of chemical changes must be excluded. But Krivit is asking the question of Shanahan. Why? Slow news day? We know that Shanahan has alternative explanations, and most LENR researchers and students have rejected them, but what could be useful is a detailed and careful examination of them. Krivit refers in an update to Shanahan’s response, but it is more or less as expected, and Krivit does not address the issues. Apparently he is unable to understand why the temperature can increase and the voltage decrease over time in the cell without excess energy from LENR being the cause. I would suggest he read the section of my whitepaper discussing the flaws in the F&P calorimetric method. THH conveniently posted a link (Mar 2nd 2017 post #92 in thread “Validity of LENR Science…[split]” “Kirk’s white paper answering Marwan et al: https://drive.google.com/file/…b1doPc3otVGFUNDZKUDQ/view) to it. Then think it through while chanting “CCS CCS CCS”. Kirk does not know how to make links work. When text is copied, as he did, the link may look like a link, but it’s been munged with those ellipses in the middle. It is one of the little joys of LF software. Rather, follow the link and then copy the full URL from the browser bar. Shanahan also could have copied the link to that post 92, the date stamp is a link that can be copied. That’s what I do. The post number is also a link. Here is his white paper. BTW, there are other reasons besides ATER/CCS for this as well (and I suspect the cause of the drift shown in the Figure is actually not ATER, that comes later in the paper). Ask an electrochemist. Shanahan has never successfully shown actual flaws in the Fleischmann calorimetry; rather, he has alternate hypotheses, unconfirmed. However, this could deserve careful discussion here. The LF style sequential commentary doesn’t lead anywhere but to useless smoke. We have to assume constant current for the discussion to make sense. 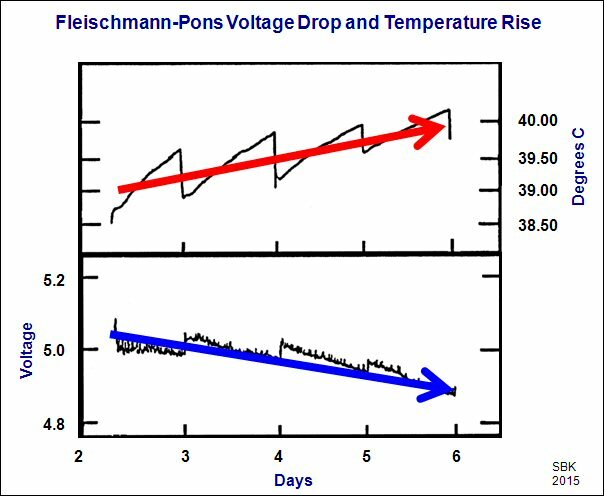 Fleischmann doesn’t actually say that the input is from a constant current supply, but gives the current as 400 mA. Krivit responded to Shanahan, but didn’t. Krivit does not answer Shanahan’s question … at all. The input voltage shows a decreasing trend, not the power, that’s what the plot shows. And this is not “steadily.” (Nor is the temperature “steadily” increasing.) But, yes, we know that this is a decreased power input. Shanahan simply pointed to his paper. Does it propose mechanisms? Well, “CCS” is Shanahan’s code word for an effective shift in cell calibration caused by unexpected recombination or a shift in where recombination occurs. Some such shift, as an example, could indeed cause an effect as shown. As well, shifts in loading could create such effects. How large is the effect? At 4.9 V and 400 mA, the input power is about 1.96 W. The claimed XP is 115 mW by the end of day 6, or about 5.9% of input power. In an SRI series, this would be considered barely reportable. However, FP calorimetry was reputed to be quite precise, on the level of 0.1 mW. Water is being split into deuterium and oxygen. That’s endothermic. Then the deuterium is absorbed by the cathode. That is exothermic initially, but moves toward endothermic as loading reaches the values necessary for the FP Heat Effect. Fleischmann-Pons calculations include these issues (or they would not be accurate; these are open cells, not cells with a recombiner where the potential energy created when deuterium and oxygen are dissociated. If there is an unexpected shift in this chemistry, the XP values would be incorrect. Ideally, the gases are measured, and loading is monitored. It’s complex. This is not a job for Steve Knee-Jerk. And it’s not a job for me, either, unless I’m prepared to put a lot of time into it. 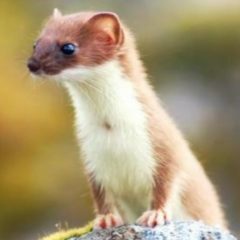 I would much prefer to see a careful discussion here, with THH and, I’d hope, Shanahan, and others, as well; here, I’d organize this so that useful content is created. He is totally free and invited to comment here. THH has author privileges and I’d give them to Kirk as well, in appreciation for his years of service as the Necessary Skeptic. Going back to the original post. LENR advocates would I think agree that they get relatively little scientific critiques from mainstream scientists, or indeed anyone who is technically competent and highly skeptical, so interested in finding holes in arguments. All this is symptomatic that this is debate, not scientific investigation, where “sides” are arrayed against each other, rehashing old issues, with issues never being fully resolved, with true consensus being elusive. To me, the big disappointment was the 2004 U.S. DoE review. It was superficial and hasty, like much with LENR. The review made claims pretending to be reports that were not supported by the review paper evidence (that were actually contradictory to it). The review process obviously did not include serious, interactive analysis of data, where errors would be corrected, instead they were allowed to stand. The review did agree that further research was warranted, and half the panel considered that the anomalous heat was real, i.e., at least there is an anomaly — or collection of them — to investigate. If the DoE had actually been paying serious attention, they would have established a LENR desk. For their part, the review paper authors made no specific request. So they got no specific result. Funny how that works. They need that. So I find no excuse for the process Kirk notes in the first posts here. Marwan et al may believe they have settled Kirk’s points. More likely (and my judgement reading the source material) they have partially addressed them. … and possibly in a somewhat misleading way. However, the context is important. Kirk had been criticising LENR research strongly, on the internet, since the 1990s. I attempted to search for his posts on vortex-l, but that list is archived in zipfiles that Google does not search. Practically useless, typical Beatty. Kirk’s points were answered again and again. To his mind, those answers were inadequate. I met Kirk on Wikipedia in 2009, when I first started investigating cold fusion. I saw him as the last standing major critic. I attempted to support examination of his ideas. I found him hostile and combative. I also attempted to present his ideas on Wikiversity. He cooperated with none of it. If there are errors on Wikiversity, anyone could correct them. The way to elucidate this is for them to defend their work against critiques of their defence – not to ignore the critiques of the defence and answer only the original points. Kirk similarly of course, but in this case I have noticed this phenomena less, he picks up on nearly all of the points made by Marwan et al. His Letter to JEM was the last stand of published LENR critique. He has complained that JEM would not publish his final reply. This would be an editorial decision, not that of the scientists who replied to him, called the “Marwan” critique. Marwan and Krivit were the original authors, and Krivit dropped out, claiming editorial misbehavior. Vintage Krivit. The Letter contained gross errors, so bad that the respondents did not even address them (and apparently did not understand them), and it was on a crucial point, Shanahan claiming to have analyzed data in a chart published by Storms, finding low correlation between heat and helium, when the chart actually shows quite the opposite. Shanahan had misunderstood the chart, which showed the scatter in heat/helium results, so the x-axis was heat and the y-axis was helium/heat. As the operating hypothesis is that there is an experimental ratio between heat and helium, that this may be a constant except for experimental error, what is actually shown is that as heat increases, the ratio settles, as would be expected from the lessening effect of fixed experimental errors. If the experimental data were perfect, there would be no correlation between heat and helium/heat. It took a long time before Shanahan admitted he had erred. His first response when I pointed it out to him was on the lines of “You will do anything to cling to your beliefs.” Pot, meet kettle. From such a to and fro one can obtained a balanced view of the likely validity of each point. Normally both sides end up agreeing, or at least agreeing that areas of disagreement require further work. Typically what happens here is that points made are valid for a specific set of circumstances, and elucidating whether than covers the matters of interest takes time and effort. The issue here is not primarily about who is right in this exchange. It is about how you convince independent observers that you are right. I prefer to set up process that will facilitate finding consensus, which may include creating new experimental results to clarify issues. There is a place in this for review and discussion of what has already been done, and I hope that this can take place here, but Wikiversity could also be appropriate. Many interested in cold fusion complain about Wikipedia suppression, but few, hardly any, would participate on Wikiversity, I found, which has standards much more like those of academia, it is not an “encyclopedia,” but more like an eclectic combination of university library, seminars, and studies, including student work. In theory, then, Wikipedia would link to Wikiversity for “further study.” That would be standard, but was always suppressed by the dominant faction on Wikipedia. It is one of the actions of that faction that would not have been supported by the full Wikipedia community, but they got away with it because of lack of attention and clear stand, lack of unity and collaboration among supporters of cold fusion, or such collaboration expressed not in accordance with Wikipedia policies. Basically, the faction banned the editors with the editorial skills needed (such as myself and pcarbonn). They were about personal winning, and not actually aligned with Wikipedia policy. Author Abd ulRahman LomaxPosted on April 28, 2017 April 29, 2017 Categories LENR history, lenr-forum, New Energy Times2 Comments on With friends like this, does LENR need enemies? Rossi claimed that he built some. He claimed they worked. I.H. tested the ones he made and the ones they made. None of them worked. But, anyway, if Rossi has one that works, he can have it tested independently. If it works, I.H. will pay up. Or, if they don’t pay up, he can easily win the lawsuit by citing the independent replication. Either way it is in his interests to have the claim confirmed independently. As is common, Wyttenbach “reminds” us of useless and possibly misleading information. I have myself stated that IH made the reactors used at Doral, but I do not recall where that information came from, it may simply be something based on RossiSays that got picked up and treated as true. There were large reactor assemblies that might be “Big Frankies” that were transported from Italy to North Carolina. Perhaps someone will point to, like, actual evidence? However, what Jed wrote simply is not so. Evidence of independent testing, if it existed, would still be irrelevant to Rossi’s basic $89 million claim against IH. That is based on nonpayment claimed to be a breach of contract, and to that claim requires that the contract require the payment, whereas there is ample evidence that the opportunity for a GPT was missed, through deliberate refusal to approve of the Second Amendment, on the part of Ampenergo (as well as other problems). That some Rossi device, somewhere else, “worked,” perhaps, even, a truly reliable test, simply doesn’t trigger that payment unless the Agreement conditions were met, and they clearly were not. What is being confused here is an IH statement of intention to pay if Rossi satisfies them — voluntarily –, with an idea that they must pay. In the counterclaim, which is distinct and different, whether or not Rossi devices work could be relevant, and evidence of independent testing could be introduced, in defense of Rossi. The original Rossi claim, though, is dead in the water — and, my opinion, very likely to be thoroughly burnt toast shortly, the evidence and facts sufficient to dismiss it being clear, and not at all vague or requiring jury assessment. What remains and what may possibly require jury review are the counterclaims, against Rossi, and including the claims against Johnson, Bass, and Fabiani. Maybe. I have not completed my review of the MSJs. However, it does appear that some Rossi claims, signed under penalty of perjury, have been egregiously false; so a risk for him has arisen of criminal prosecution. The “Johnson Matthey” issue is the clearest. He led IH to believe that JM was the real customer behind JMC/JMP, there can be no reasonable doubt of this from Rossi’s emails, plus, of course, there is the testimony of Darden and Vaughn, plus the emails of Johnson and Bass, and then he set up conditions to discourage IH from checking through direct communication with JM. All this makes no sense unless Rossi originally brought up JM — and wanted IH to continue their (mis)understanding. Meanwhile, Annesser and Chaiken apparently left PBY&A and have set up their own firm, Annesser and Chaiken, PLLC. The email address provided is on a new domain, registered April 17, 2017. It’s parked at godaddy. Annesser and Chaiken are no longer listed on the PBY&A professionals page, as they were on the latest Internet Archive page showing them. So Rossi’s lawsuit has taken half the attorneys away from Silver Law Group (the least experienced ones, to be sure). Aw, Ruth, if you read this, to steal a phrase from Lenny Bruce, you betta off. IH Fanboy (with his misleading and perhaps trolling username) repeats himself, over and over, on certain points. Generally, he does not actually cite evidence, but sometimes we can recognize the source. It’s typically misleading. Assuming this fascinating business comes to trial, I do hope that counsel for IH ensure that the idea that Rossi could could at any time have openly demonstrated a working eCat . . .
I’m going to break the rest of the IHFB comment into numbered sections. [2.] Not only that, IH (i.e., specifically Dameron) built reactors themselves. They did. They claim that they didn’t “work.” This must be understood, see below. [3.] Darden (yes, the VC guy) apparently fueled them himself. He did, and that makes complete sense. [4.] They produced COPs upwards of 9. Here IHFB simply assumes that Darden et al are lying. He has lost track of something — or willfully ignores it. Reactors do not “produce” COPs. COP is the result of a measurement analysis, and sane measurement includes the use of controls, etc. It is quite easy to calculate COPs that are wildly off, if measurements or analyses of them are in error. IH did “reproduce” Rossi claims, but then identified artifact; that is far more convincing as a negative replication than merely obtaining different results. It appears that when they used Rossi measurement protocols, they also got these elevated COPs. Or Darden et al are lying, under oath. There isn’t much more room for middle ground here. [5.] Dameron was still running them as late as January 2016 in the same building where Murray was just getting set up with his modified version of the reactor. This is irrelevant. It is not clear what IHFB’s point is. I would expect IH to continue to test well beyond the ordinary “give-up” point. The essential point for IH is that what Rossi taught them to do doesn’t work. Whether the set of reactors under test in Doral “worked” or not is actually irrelevant to the suit: Rossi did not successfully transfer working IP with commercial value. Perhaps he waved his magic wand in Doral, applied liberal amounts of Rossi Grease. It doesn’t matter. The set-up to consider that a “GPT” was radically defective, on many grounds. [6.] That is, until IH boxed everything up and closed shop, according to Murray, in response to the filing of the lawsuit. Did Murray say “in response to the filing …”? This probably is based on something from the Murray deposition. You can find it on this page, which lists all deposition exhibits. As it happens, we have the entire deposition. It is 423 pages. Which one? What appears to me is that IH finally gave up spending more money trying to validate the Rossi IP. 24· ·fell by the wayside. ·2· · · · A.· · Yes, we did. ·7· ·it’s somewhere in there, test plans and test procedures. ·9· ·tested now, if you know? 15· ·sure it’s all in there. This does not state that the “closing up shop” was “in response to the lawsuit.” Rather, they simply are not like Rossi, who destroyed possible evidence (much more relevant to the lawsuit than what IH was doing privately). They followed legal advice, and it is unlikely that Rossi spoliated the evidence upon legal advice. If so, there might be an attorney in very hot water. IHFB makes many claims without evidence, and is unreliable. @THH. What was the claimed input power in Lugano? A figure of 800Watts comes to mind, but that’s from memory. I can get a better insulated (and smaller) reactor to 1500C on 160W. So I would thin that 800W (if I am correct) would not need to be any kind of fiddled input measurement. Smith is being lazy (and my memory was a power increase from 800 early on to 900 W later). It’s easy to look at the Lugano report. Claimed input power was around 810 W., then increased to 904 – 923 W. Claimed temperature from their defective camera analysis was about 1260 C at the lower power input to 1410 C at the higher power input. Smith is likely correct in that input power measurement error is unlikely in the Lugano test. COP estimated was 3.13 – 3.74, which appears well within range of the blatant calorimetry error. It’s been claimed that using a thermal camera for calorimetry was wildly inappropriate. I’ll disagree (as did Jed Rothwell). The problem was that they misused the camera, and botched the analysis, compounded by a failure to calibrate under operating conditions (i.e., using a dummy cell at full input power). It appears that one of the shouting matches with Rossi occurred when IH pointed out to Rossi that the cell he was measuring high COP with was a dummy cell. No fuel. Oops! At that point, I suspect, Rossi concluded they were snakes. Only a snake would steal the fuel! Sorry, but you’re wrong. Rossi can do anything he likes with the IP, so long as he doesn’t SELL items made using it in the territories already ceded to IH. While I agree with you on this point, IH is (humorously) claiming otherwise in the suit. They think their territorial license somehow blocks Rossi globally. Well, what Nigel wrote is substantially true, but not completely true. He cannot do “anything he likes.” In offering licenses, in other territories, IH has, from the Agreement, a right of first refusal. Hydrofusion and certain other pre-existing licensees are explicitly exempted from this. As usual, IHFB is making things up when describing what IH “thinks.” He should get his mind-reading crystal ball fixed. They do not think what he wrote; but, hey, if they do, perhaps IHFB could quote the source, or at least give us calibration data on that crystal ball. The bottom line here is that, no matter what IH “thinks,” Rossi could have continued to market his invention, IH could not stop that, except by matching any new offers, and could not stop him from agreeing with Hydrofusion, for one, and providing them IP, if they are still willing to talk to him. Yes, I think the APCO inspired unable-to-substantiate-all-without-success is BS. And I think Darden and Vaughn did their best to stick to that story line in their depositions. Dewey suggested awhile back that he suspected Rossi’s team is gearing up to impeach witnesses. And it probably has something to do with deposition testimony compared to disclosed test report data. Well, not suprisingly I think your thinking is absurd, as I have implied over and over again. But even with the extremely remotely possibilty that you are not simply seriously deceiving yourself and Rossi actually has something, there is nothing stopping him from demonstrating his high COP system, right now, this instant. Well, if he has a high-reliability Quark-X system, nothing would actually be stopping him — other than, perhaps, his health. As to an E-Cat system, it is not at all clear that he has any devices ready to test. This would have the effect of demolishing IH, winning the court case, awarding him over a quarter of a billion (with a ‘b’) dollars, completely destroying Darden’s reputation, opening up vast amounts of VC capital in Europe and other regions not covered by the license, result in fabulously increased quality of life for all, be the greatest discovery since fire (and that is no exaggeration), result in a virtual lock for the Nobel Prize Rossi so covets, and more. No, it would not have that effect. First of all, the primary case is about $89 million. The “triple damages” thing is entirely separate, and a demonstration of a real device would have no effect on it, this is about a claim that Darden and Vaughn never intended to pay, and deceived Rossi about Cherokee, etc., all of which is terminally weak, with no substantial evidence having appeared other than Rossi hysteria. Rossi already ran “demonstrations.” But let’s assume that Sigmoidal actually means rigorous independent testing by reliable experts. “Greatest discovery since fire” is an exaggeration. Rossi did not discover LENR, nor did he discover NiH. He may have discovered a particular engineering approach, if he hasn’t been entirely a con …. but that latter possibility is looking very, very likely at this point. No, he would not get the Nobel Prize. There is no Nobel for inventions. However, Rossi has moved on to even better inventions. The mind boggles trying to imagine how awesome that will be! Yes, Sigmoidal is being sarcastic, but is feeding certain tropes in doing so. Sarcasm in posts like this doesn’t come across cleanly. But if there were any doubt, we know that a dummy reactor was measuring high COP. Yep, according to Darden’s story, he must have known as early as January of 2014 that it was all a big scam, because a dummy reactor gave the same COP as the other reactors. This is based on a deposition, and testimony in a deposition, unless controverted, is legally “fact.” However, what IHFB says here is a conclusion from Darden’s testimony, not the testimony. This confusion between fact and conclusions is common for IHFB — and others as well. What that testimony indicates is the possibility or probability of error in measuring COP, which has already been widely suspected. This does not prove it was “all a big scam,” though it certainly raises questions of major error. The problem is that we have these little things called facts. If Darden had done that and then threw the money at Rossi, it would have been a major problem. Rather, Darden et al continued to investigate, and the major funding raised was used for other projects, not Rossi. IHFB has pointed again and again to the quick reaction of Woodford to the draft IH press release in March, 2016 as if it proved that Woodford was really investing in Rossi and had been deceived. It doesn’t show that at all. There was a hope, obviously, that Rossi technology would pan out and the various failures would have been fixed. and also required everyone to leave the lab in Dec/January 2016 so that he could carefully and secretively load the scam fuel into Murray’s modified reactor. Wouldn’t want the secrets of the scam fuel to get out. IHFB is implying that this is inconsistent, but, in fact, it is fully consistent with what we know. That fuel mixture is not “scam fuel,” it would be what Rossi disclosed in 2013, and the failed test (control showing the same apparent heat as the experimental device) does not prove “scam.” It could just as easily show that Rossi had decided to torpedo the IH effort, perhaps feeling that he had not been paid or promised enough. IH simply continued with their plan (to “crush the tests”), and the fuel details divulged by Rossi (real or scam) were kept as a closely-guarded secret. IHFB is sarcastically implying that the appearance of contradiction (in his mind) proves that Darden was lying. This is how IHFB thinks, apparently. It’s not uncommon on Planet Rossi. Rossi’s reported reaction to that no-fuel finding demonstrates that he is definitely not a scientist. A scientist would be very interested, not angry. However, if that was a no-fuel test without telling Rossi, it would have been (1) brilliant, and (2) very likely to set him off. Rossi clearly cannot stand independent testing, and a test that might show him up, proof that they are snakes. IHFB went on and on with preposterous claims, as the LF thread on Rossi v. Darden wanders far from the nominal topic with the full collaboration of at least one LF moderator, now over 7000 posts. No, in the U.S. court system the burden of proof is on Rossi. The defendant is assumed innocent. You have to show strong evidence that the test worked, I.H. knows it, and it tried to cheat Rossi. I.H. cannot be found guilty if they have a legitimate difference of opinion regarding the test results. Jed is confusing civil with criminal liability. “Guilt” is not an issue in civil cases. A clue is that mens rea (guilty intention) is not required to find civil fraud. The basic Rossi case was a claim of breach of contract, so for a court to find liability under the contract, the elements would have to be shown. The test “working” was not actually part of the contract, this was first noticed by Planet Rossi, which thought that the case was ironclad. Basically, test results were up to the “ERV.” That is how it was written, Wyttenback is correct about that. However, there are some problems for the Rossi claim. First of all, the Agreement was not followed in setting up the faux GPT. To allow a postponed GPT, the Second Amendment was attempted, but that failed because of Ampenergo refusal to sign, a fact that Rossi left out of his complaint. IH only claimed, in their MTD, a technical failure, missing signatures (and then the “6 cylinder unit” issue, which simply shows that the Second Amendment, never having been completely executed, was ignored (until it came time for Rossi to make his $89 million claim). 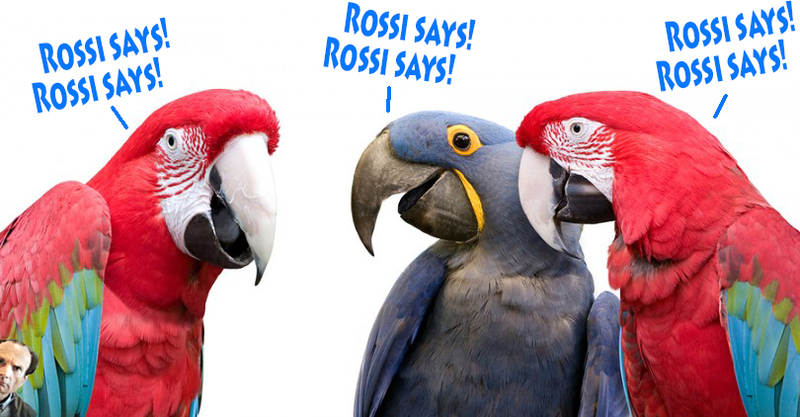 Easily, IH and Rossi could have made a side-agreement, but Rossi did not attempt that, apparently. Instead, he set up a faux customer to encourage IH to give him possession of the reactors, and arranged for Penon to measure heat — all of this without mentioning “GPT.” Far from getting the signatures of “all parties” to the start of a GPT, as the Second Amendment required, had it been valid. If Rossi and IH had clearly agreed on Doral as a GPT, and Penon as the ERV for it, Rossi’s case would have been far stronger. Yes, IH could possibly defend on various bases, and a claim of fraud would be one of these. But the initial presumption would be as the Agreement had it: the ERV report was binding. I think IH felt safe with that because the originally contemplated GPT would have been in their facility where they could observe it very closely. There is no presumption as Jed describes in civil cases. Rather, the judge or a jury is looking for equity, and a jury decision must be unanimous — in Federal Court — and there is no presumption at law as to which party is right. A requirement for absolute proof (“beyond a reasonable doubt” in criminal cases) could be quite unfair. The standard is merely the preponderance of the evidence, for the trier of fact (i.e., the judge or the jury in a jury trial). By the way, can you point out to me where Penon’s deposition was under oath? I have “lost” that. I would think that it is in there but not finding it. The attestation of the notary. By the way, there is a list of all deposition exhibits, with a Table of Contents at the top, so that any deposition can be quickly found, and I’m going over it to list what pages are included in each copy. I may then create composites with all the pages we have.